Clara (Official No. 26370) was built at Sunderland in 1853 – probably, but not confirmed, by Sir James Laing (1823-1901) at his yard at Deptford. She was a three-masted ship of 629 (708) tons registered in London by her owner John Henry Luscombe (1797-1883). Clara was an oak ‘late frigate’ hull type. She had two decks, a poop and square stern and was endowed with a female bust figurehead. Clara’s dimensions were length 144.5 ft.; breadth 30 ft.; depth 20 ft.; draught 15 ft. In the year she was built she was sheathed in yellow metal which may account for the additional tonnage shown in Lloyds. 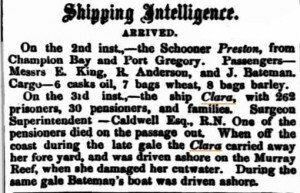 She was NOT another vessel named Clara that brought convicts to Western Australia in 1864. Clara 1864 was a ship of marginally larger dimensions built by Laing six years later. The Lloyds Register for 1864 lists both of these ships. Clara left London on March 19, 1857 bound for the Swan River Colony. She carried the 18th of 37 shipments of male convicts destined for Western Australia. The voyage lasted 106 days and arrived in Fremantle on July 3, 1857 with 95 passengers and 262 convicts. Henry Peachey and Joseph Caldwell were the captain and surgeon respectively. Henry Peachey had captained the Clara on two previous voyages to Australia. Clara left Southampton in June 1853, reaching Fremantle in record time of 86 days; in August 1854 she sailed from Plymouth to Portland Bay, Victoria. On each of these voyages there was a significant number of single women on board. Joseph/Josiah Caldwell, the Surgeon Superintendent on the voyage joined the Royal College of Surgeons, England in 1841. He was a seasoned surgeon on convict ships having previously served on ships to Van Diemen’s Land well as the convict transports to WA – Sea Park (1854) and Stag (1855); thus Clara was his third voyage to Fremantle. Of the 95 passengers mentioned above, all were pensioner guards and their families, the number being made up of 29 pensioner guards, 23 wives, 21 sons and 22 daughters. Despite the detailed head count of the Enrolled Pensioner Force and its family members (Bruce), identifying the names of the 29 men is problematic. One pensioner died on the voyage, but his name is also unknown [Inquirer]. Clara made a dramatic entrance into the Colony: “The convict ship Clara dropped her anchor in Owen’s anchorage on Saturday last after a providential and miraculous escape from shipwreck. The violence of the gale on Wednesday night drove her to the southward, and on to the Murray reef, over which she was driven without touching, although there is usually only six feet of water upon it ; she there anchored and sustained only a slight damage from the chain chafing against the cutwater” [Perth Gazette]. There were no deaths recorded on the convict shipping and description lists and 262 convict numbers were assigned for the voyage ranging from 4239 to 4500. Joseph Murphy #4271 was the earliest convict to arrive in Western Australia who fought in the Crimean War. At least six of the enrolled pensioner guards had fought in the war. Murphy, a Private in the 12th Lancers, was 23 years old when he was court martialled in August 1855 at Sevastopol for desertion, insubordination and mutinous language. He was received at Millbank Prison in October and transferred to Portland Prison eight months later. There he stayed until boarding Clara bound for Fremantle. Thomas Woods #4320, another convict (not a Crimean War veteran) was sentenced to 20 years penal servitude for the manslaughter of Inspector William Donaldson, the first Surrey (England) police officer to be killed while performing his duty. In 1861 Clara acquired new ownership – Stuart & Co. (Peter Stuart and Peter Douglas). At this time she was registered in Liverpool and began another twenty years of trading, mostly around West Africa. Clara was difficult to identify because in 1857 eight ships of that name were journeying on the high seas. Entries in Lloyds Registers were consistent over the years, but in other resources variations in her stated tonnage made it difficult to identify her official number. The problem of finding the names of the convict guards has been mentioned. Not a great deal is known about her original owner and her builder has not been confirmed. And if Surgeon Caldwell maintained a journal of the voyage, it seems not to have survived. Clara is indeed a difficult lady. Crew List Index Project (CLIP). Royal Engineers’ Expedition to the Swan River Colony p.19, Derrick Prall 2001. Dictionary of Western Australians Vol. 3, p. 930 (Immigrant Ships 1850-1868), Rica Erickson. Free Setter or Felon? Website. Lt Col Bruce Return of Enrolled Pensioners AJCP Reel 1658, CO18/159/168. Registers of Court Martial WO90 (Abroad) 1855, National Archives, Kew. Millbank Prison Register 1855 courtesy of Bevan Carter. William Donaldson (1807-1855) – The First Surrey County Police Officer to be killed while on duty, Henry F. Pelham, 2015. Inquirer & Commercial News 8 July and 15 July 1857. Perth Gazette 10 July 1857.